Orbital ATK's first Antares rocket since a 2014 accident stands atop its Pad-0A launchpad at NASA's Wallops Flight Facility on Wallops Island, Virginia on Oct. 15. Nearly two years after a privately built Antares rocket crashed and exploded, the booster's builder Orbital ATK is ready to return to flight. Tonight (Oct. 16), an upgraded version of the Antares rocket will soar into the sky above Virginia's Eastern Shore, a nightttime launch that could be visible to potentially millions of observers up and down the U.S. East Coast, weather permitting. The Antares rocket will launch Orbital ATK's Cygnus spacecraft on a NASA cargo delivery mission to the International Space Station. Liftoff is set for 8:03 p.m. EDT (0003 Oct. 17 GMT) from Pad-0A of the Mid-Atlantic Regional Spaceport at NASA's Wallops Flight Facility on Wallops Island, Virginia. 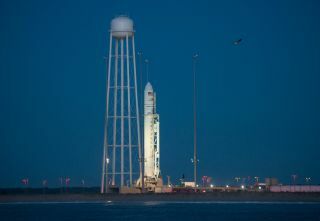 Because of its nighttime timing, the Antares rocket launch may be visible to observers on the U.S. East Coast (from as far north as Boston; as far south as the upper coast of South Carolina; and as far inland as Charleston, West Virginia) as it launches to the southeast out over the Atlantic Ocean. Read our complete viewing guide for the launch here for tips on how and when to see the rocket from your area. So far, there is a promising forecast for the liftoff, with NASA officials saying there is a 95-percent chance of good launch weather. The Antares mission, called OA-5, is a major milestone for Orbital ATK, which has had to fly two Cygnus cargo missions for NASA on Atlas V rockets provided by a competitor, the United Launch Alliance, in the wake of the Oct. 28, 2014 rocket explosion that put Antares flights on hold and caused $15 million in damage to its launchpad. During that 2014 accident, the Antares booster's first stage suffered a failure in one of its two Aerojet Rocketdyne AJ26 engines, refurbished versions of engines originally built for the Soviet-era N-1 moon rocket. Over the last two years, Orbital ATK replaced the engines with Russian-built RD-181 engines, a swap that also included some structural and avionics upgrades to the booster, company representatives said. "It was a very detailed and meticulous process," Mike Pinkston, Antares program vice president and general manager at Orbital ATK, told reporters in a press conference late Saturday (Oct. 15). Pinkston added that the upgraded booster has already passed a static fire test. "We got it right and we're ready to go tomorrow." The unmanned Cygnus spacecraft launching aboard Antares tonight is packed with 5,100 lbs. (2,313 kilograms) of science experiments, harware and supplies for astronauts on the International Space Station. Frank Culbertson, Space Systems Group President for Orbital ATK, added that the station's crew might find some goodies onboard when they start unpacking the spacecraft. "Every cargo mission is like Christmas, right?" Culbertson said. "And they never know what they're going to find when they open the hatch." Orbital ATK named the OA-5 Cygnus the S.S. Alan Poindexter in honor of the late NASA astronaut Alan Poindexter, a veteran space shuttle commander who died in an accident in 2012. If all goes well, Cygnus will arrive at the International Space Station on Wednesday morning (Oct. 19) and be captured by astronauts using a robotic arm. It should arrive just hours after three new space station crewmembers launch to the orbiting lab from Baikonur Cosmodrome, Kazakhstan aboard a Russian Soyuz vehicle, NASA officials said. The Cygnus spacecraft will remain docked to the space station until November, when it is due to be detached by robotic arm and be disposed of by burning up in Earth's atmosphere. Before its fiery demise, however, Cygnus will raise its orbit up to 450 kilometers (nearly 280 miles), which is higher than the International Space Station's orbit, to deploy four Lemur cubesats for the San Francisco-based company Spire, which is developing a constellation of small satellites to track ships and weather. NASA scientists plan to intentionally ignite a fire inside Cygnus before it falls back to Earth. The experiment, called Saffire-II, is the second in a series of studies to study how fires behave and grow in weightless conditions. Editor's note: If you capture an amazing photo of the Antares launch and would like to share it Space.com for a story or gallery, send comments and images in to spacephotos@space.com. Visit Space.com tonight to follow the Orbital ATK Antares launch and Cygnus' OA-5 mission to the International Space Station.